"One newspaper and one politician truly fought a public battle against the unfair trial of patriots Bhagat Singh, Rajguru and Sukhdev. The paper was the The Tribune and the politician was Jinnah," says historian K.C. Yadav, former Head of the Department of History, Kurukshetra University. A scholar of modern history with special reference to Punjab and Haryana, Yadav is in the process of editing along with Babar Singh, nephew of Bhagat Singh, 10 volumes on the life, times and writings of the national hero who, Yadav feels, has not yet been assessed in totality till date. In an effort to put Bhagat Singh in a proper perspective, Yadav and Babar have done a thorough research of the writings of the patriot as well as what was written on him. The 10 volumes include a very special volume called Sixty minutes on the Gallows: The Tribune Construct of the Last Days of Bhagat Singh. The role that The Tribune played, under the guidance of its founder Dayal Singh Majithia, in the freedom struggle of the country against British imperialism is now a part of the syllabi in journalism schools. It offered a complete contrast to the pro-British The Civil and Military Gazette. However, a specific study of the role the paper played in Lahore vis-à-vis the trial of the three martyrs is specifically being highlighted in this volume. Interestingly, the report of the bomb explosion in the Legislative Assembly was the banner headline of the newspaper on Wednesday, April 10, 1929, yet the identity of Bhagat Singh was not known to the paper for he was an underground worker. Thus the news reads: "Two young men, one a Punjabi and the other a Bengali entered the Legislative Assembly, dropped Red leaflets, threw bombs and fired pistols. They were arrested." The recent times have seen much debate on whether Jinnah was secular or not. The debate continues without being resolved yet history does record the manner in which Jinnah criticised the special ordinance under which Bhagat Singh, Rajguru and Sukhdev were tried and sentenced to death as also the deplorable conditions under which they were kept in the Lahore Central Jail. Yadav says, "No other politician worth the name criticised the Ordinance as Jinnah did." In his speech delivered in the Central Legislative Assembly on September 12 and 14, 1929, Jinnah took up cudgels against the British by saying that if a large body of people admired or were sympathetic with the accused, sympathy arose because they were victims of the system of government. Pointing out to the ill-treatment meted out to them in the Lahore jail, Jinnah said: "Why don’t the Punjab Government give them the treatment that they are entitled to, at once, and be done with?" He added that the government was at war against the accused and said that they were pursuing every possible method to send them to gallows and not treat them like decent men. The last words of the speech were loaded with the sentiments of a people crying out for freedom: "And the last words I wish to address the Government are, try and concentrate your mind on the root cause and the more you concentrate on the root cause, the less difficulties and inconveniences there will be for you to face, and thank Heaven that the money of the taxpayer will not be wasted in prosecuting men, nay citizens, who are fighting and struggling for the freedom of their country." Yadav says: "From an unknown person in 1929, Bhagat Singh grew into a national hero by the time he was executed in 1931 because of his remarkable speeches in the court. And The Tribune carried on a battle in his support fearlessly." 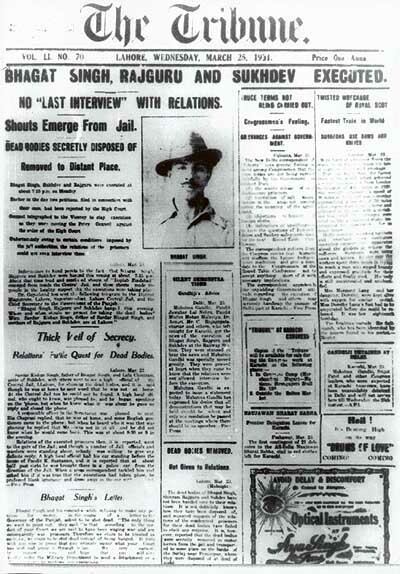 The Tribune of April 18, 1929, carried on the front page a photograph of Bhagat Singh taken from his family or friends in which he poses in his famous shamle-wali turban and the caption reads: Bhagat Singh, one of the accused in the Assembly bomb Case. On October 9, 1930, The Tribune carried an unprecedented editorial, in six instalments, against the Lahore Conspiracy Case. The editorial opens with these lines, "The curtain has fallen on what must be regarded as one of the most sensational trials of our times. For reasons more than more the Lahore Conspiracy Case has a claim to go down in history." What followed was a loud and clear protest. Yadav points out, "The Tribune carried the trial proceedings in total while other papers tried to suppress it." On October 9, 1930, when Bhagat Singh and his two compatriots were sentenced to death, a special evening edition of The Tribune reported the uproar in the city: there were protests, strikes, picketing of Government College and two arrests every five minutes. The newspaper of March 25, 1931, in bannered grief cried out against the execution of the three young heroes. It displayed the famous photograph of Bhagat Singh in a hat, which was taken in a studio in Chandni Chowk in New Delhi after he escaped from Lahore with Durga Bhabhi after the killing of Saunders. The headlines on page one screamed: ‘BHAGAT SINGH, RAJGURU AND SUKHDEV EXECUTED.’ ‘No Last Interview with Relations.’ ‘Shouts Emerge From Jail.’ ‘Dead Bodies Secretly Disposed of’, Removed to Secret Place.’ That issue of The Tribune also reported of Bhagat Singh’s last letter that carried a request to be shot dead. Instead, he was kept 60 minutes on the gallows before being declared dead. Freedom for the nation came 16 years later.